I haven't the skill yet to add a link to my etsy account here. So I am going to put it in the post and hope that the crafter fairies are happy with me. The main reason for the blog is to get me to upcycle all the fun things that I wanted to try doing and finish all the ufo's and get them new homes. http://www.1makerofstuff.etsy.com/ is the link to the etsy site. 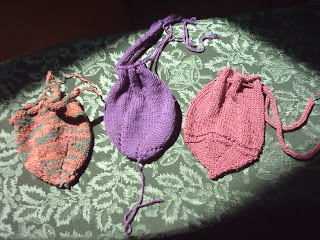 These are some of the knit bag ufo's done on double pointed needles.